Sharp-tailed Sandpiper: Medium sandpiper with dark brown upperparts and white underparts with faint olive-brown streaks on breast and sides. Head has rufous crown and, white eye ring. Wings are dark brown. Tail is dark brown and pointed in flight. Swift direct flight with rapid wing beats. Solitary Sandpiper: Medium sandpiper, pale-spotted, dark brown back and rump, white underparts with streaks on neck and sides. Head is dark, eye-ring is bold white. Tail is black with conspicuous black-and-white barred edges. Bill, legs, and feet are olive-green. Direct flight is light and bouyant. Spotted Sandpiper: Medium sandpiper, olive-brown upperparts, white underparts with bold black spots. Eyebrow is white. Wings have white stripes visible in flight. Tail is barred. Dull yellow legs. Low direct flight, wings flap in shallow arcs, producing clipped, stiff wing beats on drooping wings. 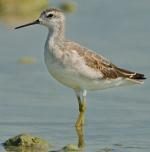 Stilt Sandpiper: Medium sandpiper with gray-brown upperparts, white rump, heavily barred white underparts. Head has a dark cap, white eyebrows, and brown ear patches. Bill is long, black, and curved down at tip. Legs are long and gray-green. Powerful, direct flight on long, rapidly beating wings. Western Sandpiper: Small sandpiper, chestnut-brown, scaled upperparts, white underparts dotted with rows of dark chevrons. Head streaked with brown wash on face. Bill is dark and decurved at tip. Thin white stripes visible on dark wings in flight. Black legs and feet, partial webbing between toes. Whimbrel: Large, long-legged sandpiper, brown and white mottled upperparts and buff underparts with faint streaks on sides and flanks. Crown is white-striped black and neck is long and streaked. Bill is long, black, and decurved. Tail and rump are brown and black barred. Legs and feet are blue-gray. Willet: Large sandpiper with mottled gray-brown upperparts, white rump and lightly streaked and barred white underparts. Broad white stripes on black wings are visible in flight. Tail is white with dark brown tip. Legs are blue-gray. Flight is short and low, alternates rapid wing beats with glides. Wilson's Phalarope: Medium sandpiper, gray-brown upperparts, red-brown streaks on back, shoulders. White underparts with red-brown markings on upper sides. Gray crown, white face, black eye-line that continues down neck. Black needle-like bill. Gray wings with dark flight feathers. White tail, rump. Wilson's Snipe: Medium sandpiper, brown and black mottled upperparts, buff stripes on back. White underparts, dark bars on sides, flanks. Heavily streaked head, neck, breast. Yellow-green legs, feet. 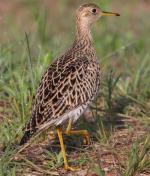 Formerly considered a subspecies of the Common Snipe, which has 14 tail feathers to the Wilson's 16. Wood Sandpiper: Medium, long-legged sandpiper with dark gray-brown upperparts and breast heavily marked with white spots and notches. Underparts are white; legs usually green, but may be yellow and lead to confusion with Lesser Yellowlegs. Underwings pale gray; rump is white with black-barred tail.